Toning shoe lawsuits have been filed against the makers of tone-up shoes alleging that the shoes were defectively designed and caused harm to people who wore the shoes. Among the claims in some toning shoes lawsuits are that the shoes were falsely advertised, including misleading statements about the health benefits linked to the shoes. Among companies involved in litigation are Reebok toning shoes and Skechers Shape-up Shoes. Send your Toning Shoes claim to a lawyer who will review your claim at NO COST or obligation. Toning shoes are marketed as shoes that help people get into shape simply by wearing them while walking. The shoes have a "rocker bottom" which is meant to provide some instability to the walk, making the person's legs work harder during normal activities. Shoemakers promise that the shoes will provide the wearer with health benefits. Among the reported promises by the shoemakers are that the shoes promote weight loss, tone muscles, improve posture and reduce stress on joints in the legs. According to The New York Times (09/28/11) toning footwear resulted in sales of more than $1 billion in 2010. Meanwhile, Reebok sold more than five million pairs of toning shoes in 2010. Critics argue, however, that the shoes do not work and, furthermore, that they cause injuries. Toning sneaker injuries include stress fractures, joint injuries and tendon ruptures. Critics also argue that because the shoes are unstable, people wearing them can suffer falls that cause harm, including violent ankle fractures. The Consumer Products Safety Commission reportedly received 65 toning shoe complaints from consumers between March and July 2011 (as cited by Trial Magazine). Among the toning shoe complaints were significant compound fractures caused by regular walking activities, and broken wrists and traumatic brain injuries caused by a fall while wearing the shoes. In September 2011, Reebok International agreed to pay $25 million to settle allegations that the company made false claims about its toning shoes. The lawsuit was filed by the US Federal Trade Commission (FTC) and alleged the company's claims that the toning shoes provided extra muscle strength were unsubstantiated. Specifically, the claim that the Reebok EasyTone and RunTone shoes "strengthen and tone key leg and buttock (gluteus maximus) muscles more than regular shoes" (as quoted by Reuters; 09/28/11) was considered misleading. Furthermore, the FTC took issue with Reebok's claim that Reebok EasyTone shoes strengthen hamstrings and calves by up to 11 percent, while they tone the buttocks up to 28 percent over regular sneakers. The $25 million was to go toward refunding customers. If you or a loved one has suffered damages in this case, please click the link below and your complaint will be sent to a toning shoes lawyer who may evaluate your claim at no cost or obligation. 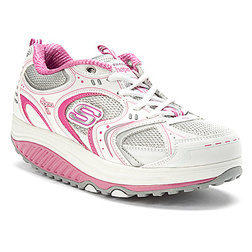 Skechers Shape-Up Shoes has caused me so much pain. I thought it was because they were new and hard to adjust to but I have had nothing but pain in my feet and legs and back ever since I started wearing them. I went to the Dr. and was told caused from the sport shoe I was wearing. I have leg cramps so bad, I cried. I got second degree burns on both my hands and most of my fingers from falling on a wood stove. I was wearing those MBT shoes at the time. I had my danskin now shoes on and went out the door. went to take the first step down and down i went. I went to the ER and was placed in a soft cast until the swelling went down. Still having trouble with swelling in the ankle due to the fall in the shoes. While wearing the toning shoe (Champion Brand), I fell and had to be rushed to a hospital, where I had surgery. The doctor put pins and screws in my leg. Had to have a second surgery because the screws from the first one did not hold. I am in a cast right at thie very moment. While wearing my Sketchers Shape Ups, I lost my balance walking up my driveway and fell. As a result of this fall I fractured my knee cap. This happened on Good Friday 2011. I had to go to the emergency room for treatment.